Locate a small patio like this one, of brick, as far from the house as possible, so it feels like eating there is a destination. Add a great picnic table and bring on the picnic basket. 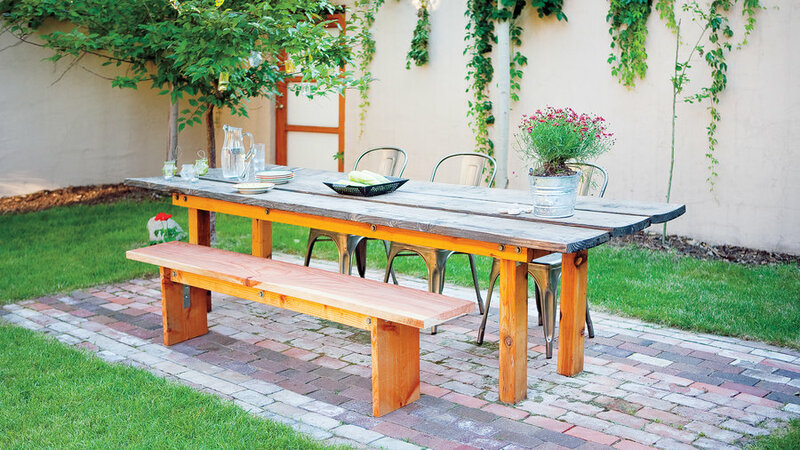 Using recycled materials can lower the cost of this do-it-yourself table. 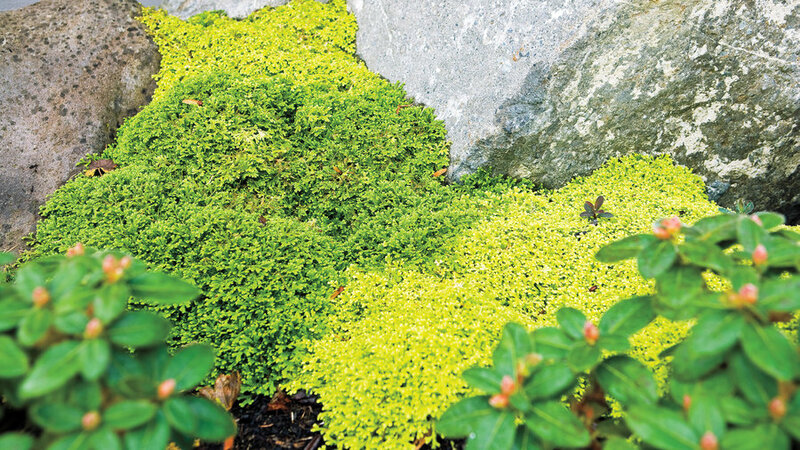 To keep boulders from looking “plopped in place,” plant a carpet of golden green Scotch moss and deep green Irish moss around them, then let the plants ramble together. Add slightly taller plants nearby, such as this northwest native bunchberry, which blooms in late spring. Let your gate give a nod to your favorite plants growing nearby. 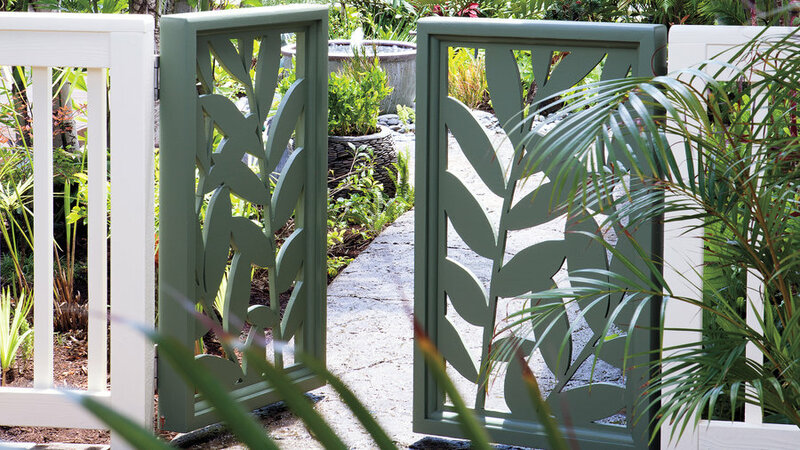 To build this gate’s leafy insets, Charlie Castro and Randy Hixon used foliage from the garden’s red ginger plants as templates, tracing the outline of the leaflets on plywood, cutting around the leaf shapes with a saw, then enclosing the wood leaves in frames made of 2-by-4s. The gate is painted soft gray-green. 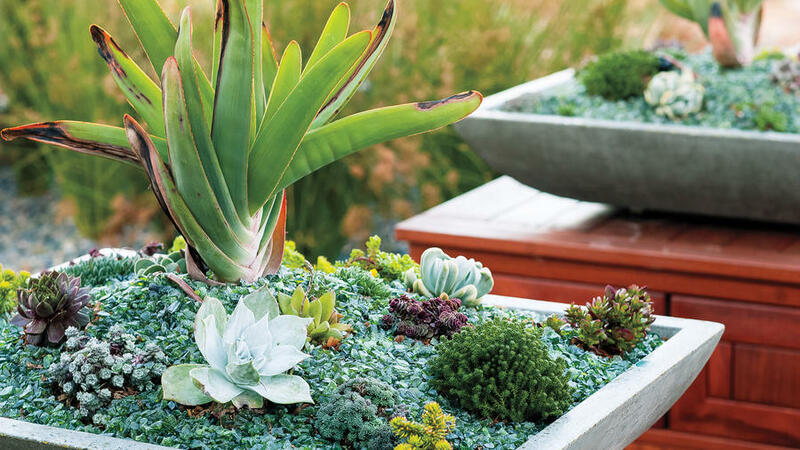 Planted in square, custom-built concrete containers, these succulents resemble mini tidepools. Use a tall Aloe plicatilis to rise like kelp above silvery gray dudleya and small sedums. 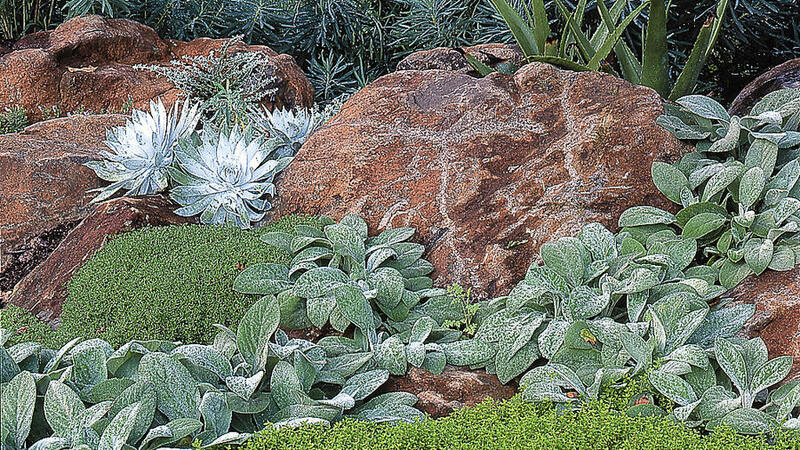 Finish by covering the soil around the plants with fine blue-gray stone mulch. 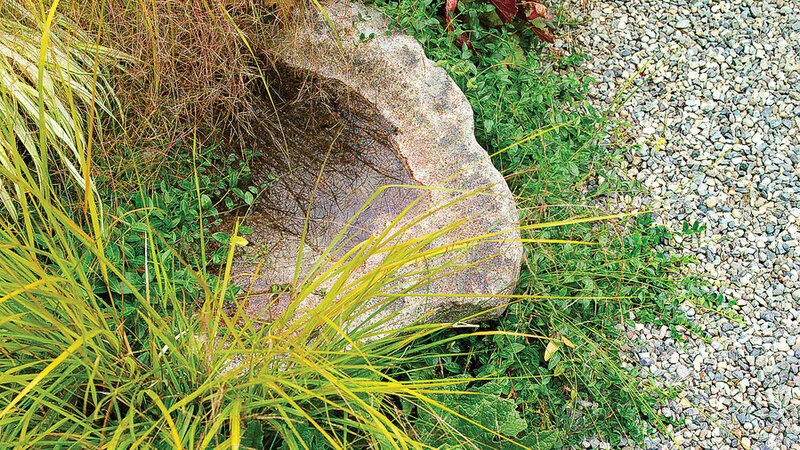 Press some shell fragments into wet integral-colored concrete hardscape to reinforce a garden’s beachy theme. 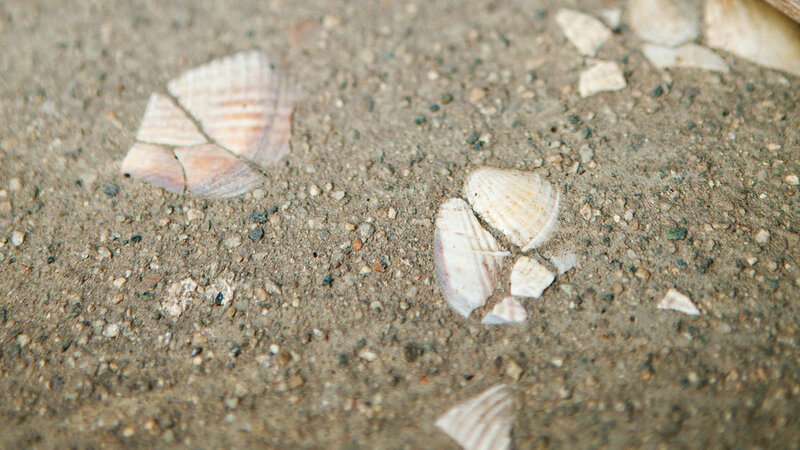 Then use a broom to brush away some of the surface concrete to expose the shells along with some of the aggregate. Looking for a way to dress up a plain wood fence? 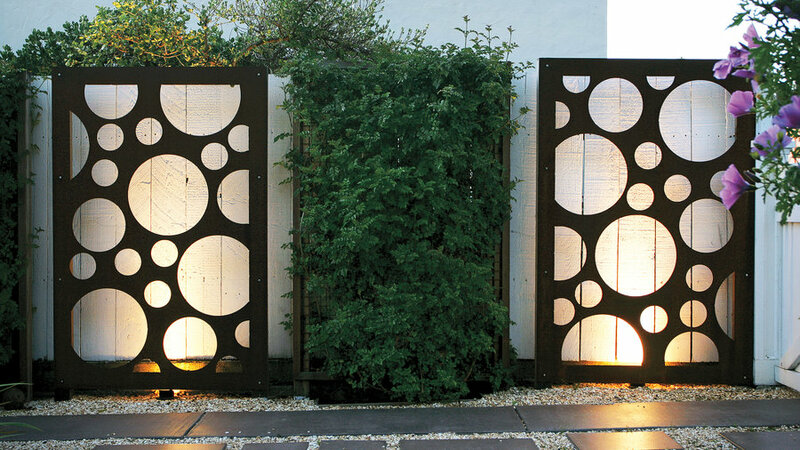 Try painting it white and using it as a backdrop for decorative metal panels with cutout circles or other shapes. The effect is especially delightful at night, when uplights give the impression of a projected image. Here’s a fun weekend project that the kids will love. 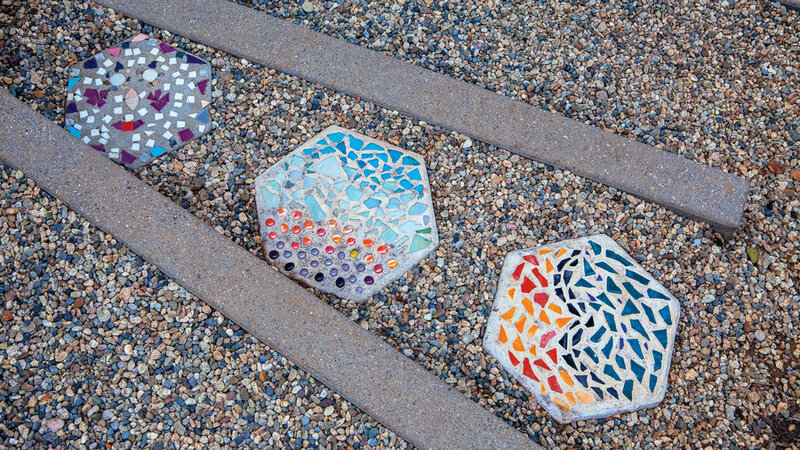 To bring new life to a gravel walkway, add concrete stepping-stones with whimsical inlays. Start by filling hexagonal forms with concrete. While they're still wet, embed them with bits of colorful glazed pottery. Kits are widely available online and in garden centers. Plant low grasses or groundcovers along the path to fringe its edges. Here, ‘Tom Thumb’ cotoneaster and yellow Japanese forest grass fan out over a baby gunnera. For a pretty vignette near a patio, plant a soft stream of woolly lamb’s ears (Stachys byzantina) so it appears to flow between two kinds of thyme. To accent, tuck in some striking whitish Dudleya brittonii, as shown in this Napa, California, garden. 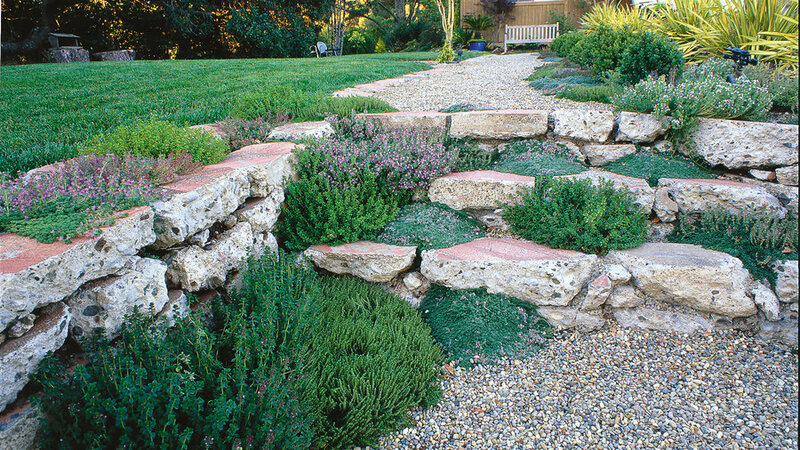 Tuck some different kinds of thyme, from silvery to green, into joints between pavers to soften the appearance of garden steps. Their leaves will release a delightful aroma when you brush against them. 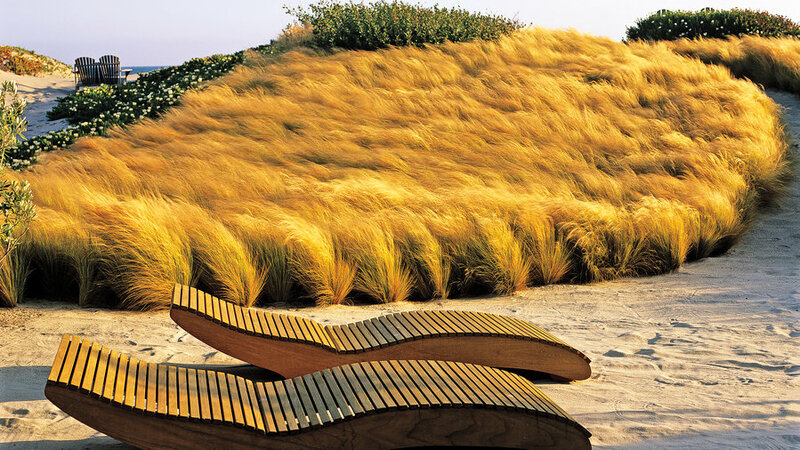 Turn a grassy border on a gentle slope into a work of art. 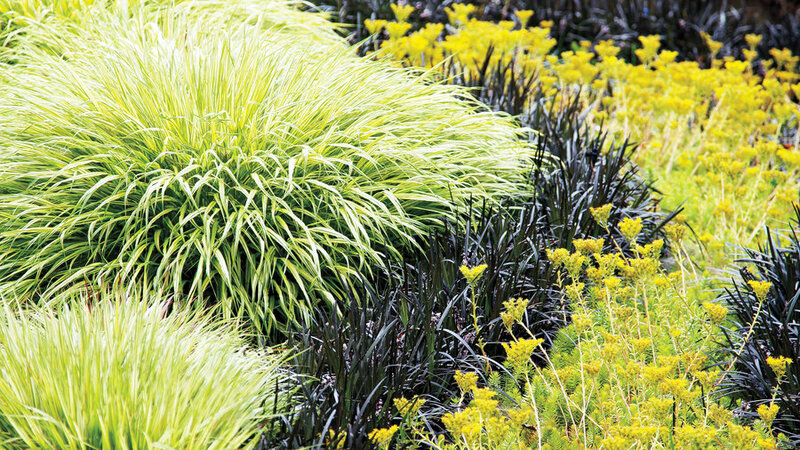 Simply plant a curving ribbon of black mondo grass between creamy Japanese forest grass (Hakonechloa macra ‘Aureola’), and a flowering lime sedum ‘Angelina’. As it grows, the planting will start to look like currents in a stream. 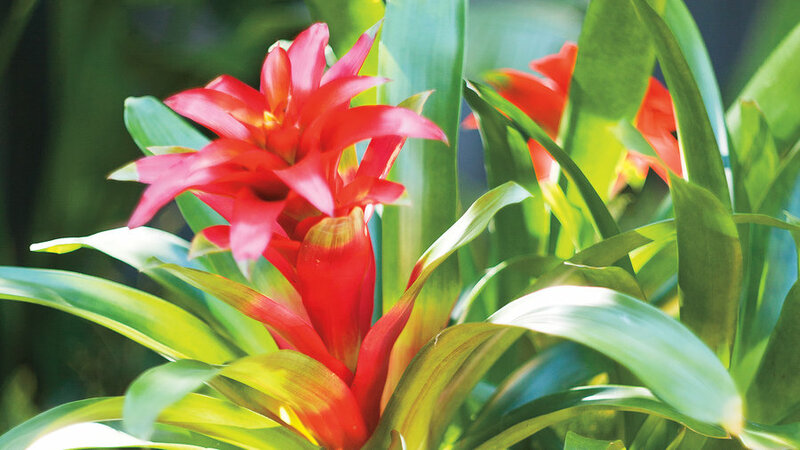 For quick hit of the tropics in the summer garden, bring in some bromeliads. Guzmanias (pictured) are widely available, and have green leaves and brightly colored flower bracts that last for weeks. Vriesias have wider leaves and vivid, paddle-shaped bracts. Both are easy to grow. Plant several in a wide bowl to display on a lightly shaded patio. 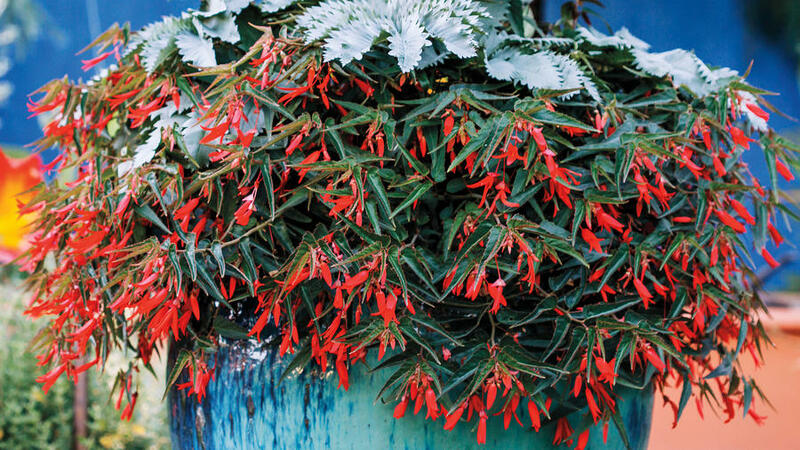 Unless you live in the tropics, over-winter these plants indoors. 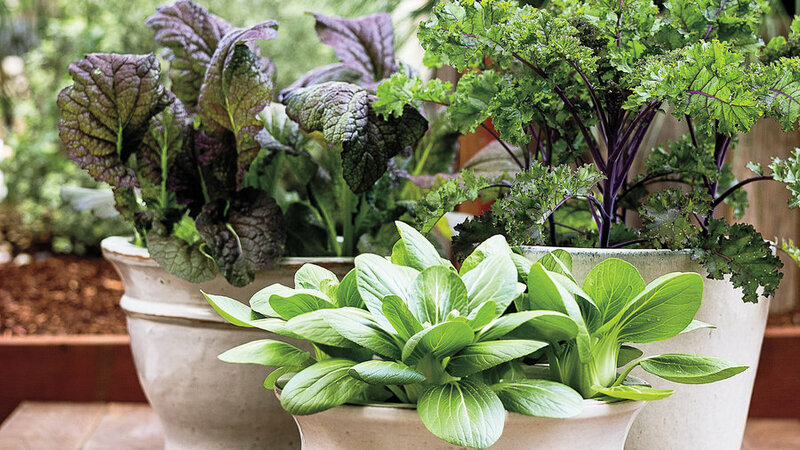 For a fresh, modern look, plant leafy cool season crops in a trio of contemporary pots—similar in size and shape but not identical. Pictured left to right: ‘Giant Red’ mustard, bok choy, and ‘Redbor’ kale. Tiny rosettes of Sempervivum cover this tray-top table except for the spaces left for pots of Kalanchoe luciae and the tiles set in to hold wine or martini glasses. 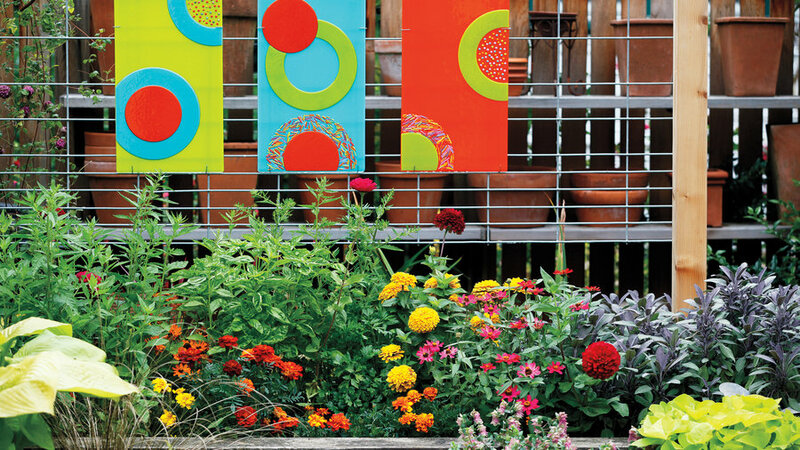 To camouflage a garden workspace, try this idea from Linda Ernst’s Portland garden. 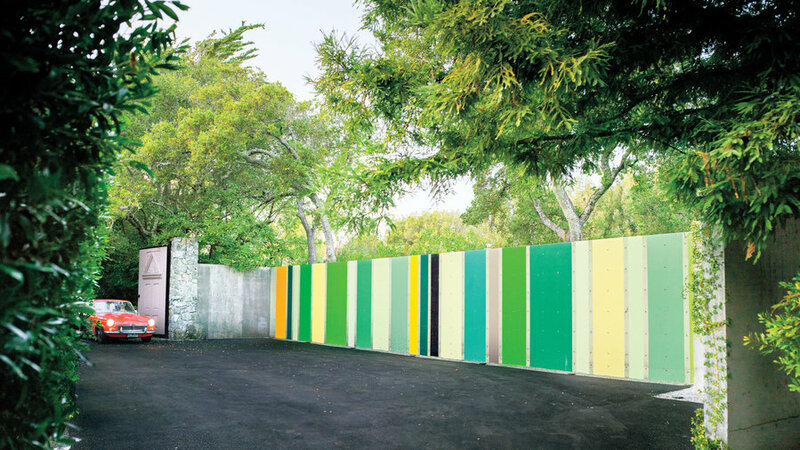 Put up a sturdy hog fence in front of the offending view, then dress the fence with some vivid outdoor art—such as Linda’s three panels of fused glass. The panels stop your eyes at the flowers instead of letting them travel to the storage shelves in the background. Plant this eye-catching container for a finished look from top to bottom. 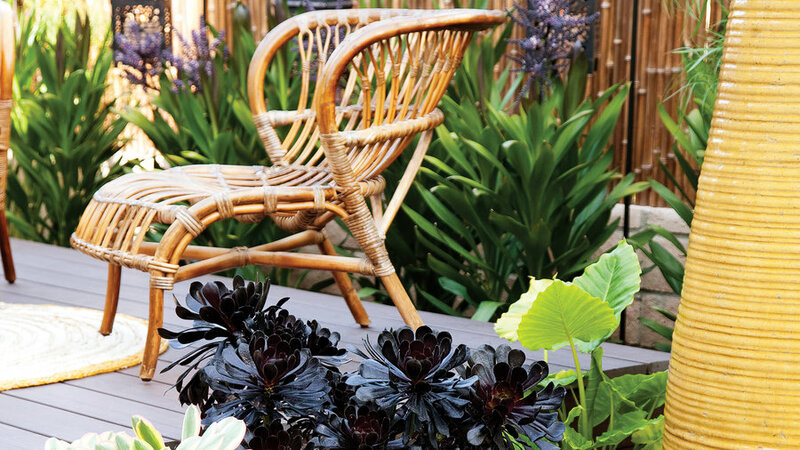 Fill large glazed blue pot with vivid plants, like the Begonia boliviensis ‘Bonfire’ and Melianthus major pictured. 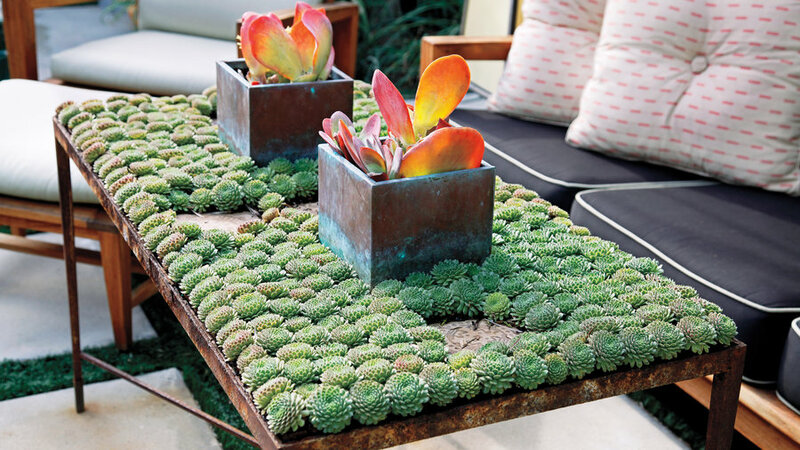 Then tuck chunks of blue glass and little pots of gray-blue succulents around the base. 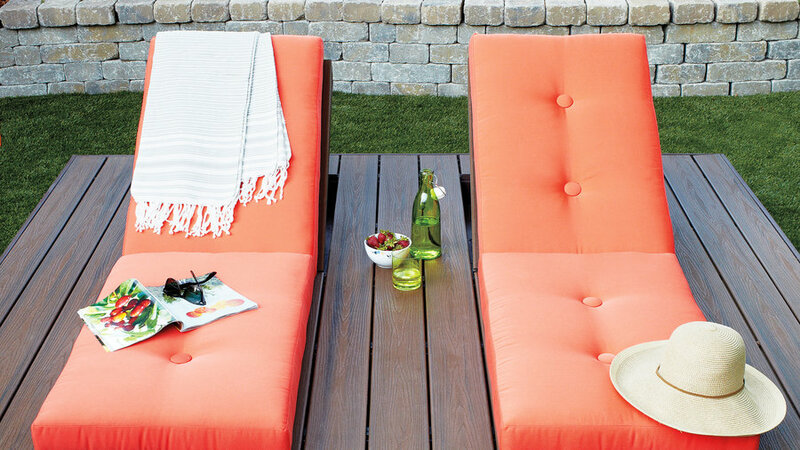 Hang up some pretty fabrics to lightly shade a patio for a tropics-themed party. 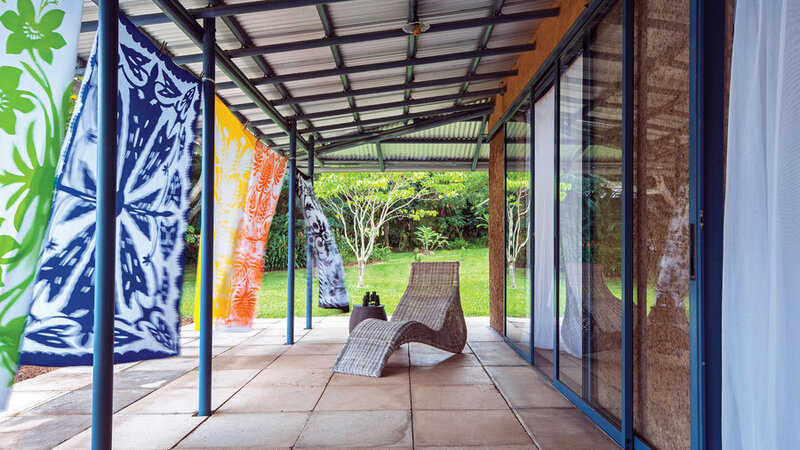 Pareus, usually worn as wraparound skirts, shade this lanai in Hana, Maui. They also add charm, billowing with every breeze. That each is just one color on a white background unites them in theme. 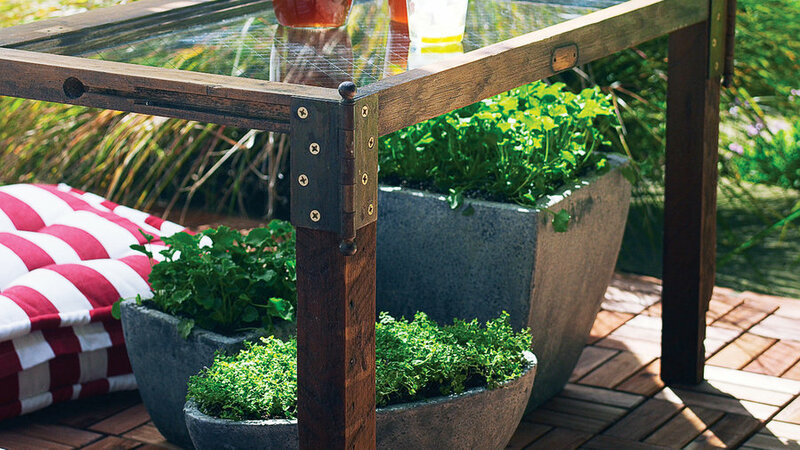 Turn an old window frame with safety glass into a garden table by securing legs cut from a 2-by-2 and attaching them with door hinges as brackets. New brass screws give some sparkle to the rustic look. If your window doesn’t have safety glass, add a sheet of sturdy transparent plastic cut to size by a supplier such as . To visually cool a patio, throw down a fancifully cut-out carpet of synthetic grass. Lunar-looking chairs and a matching table look even more surreal on this one. Place recycled plastic globes around a small patio, then put tea lights inside each one. When night falls, they'll glow like little moons. 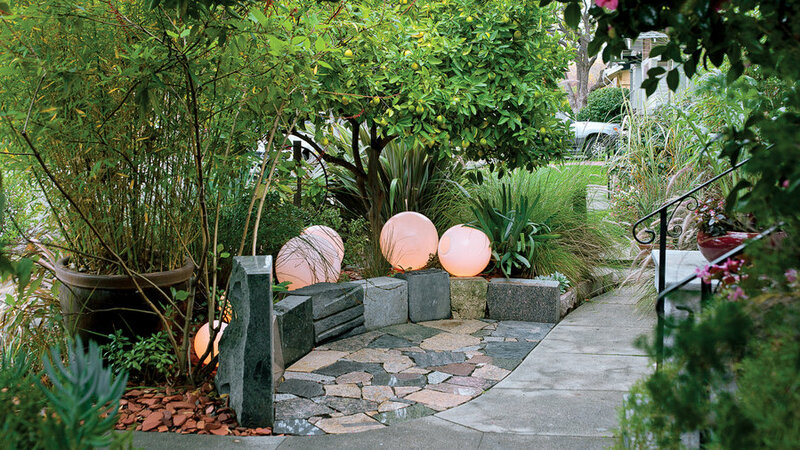 These globes lighten a patio built from recycled granite stones. 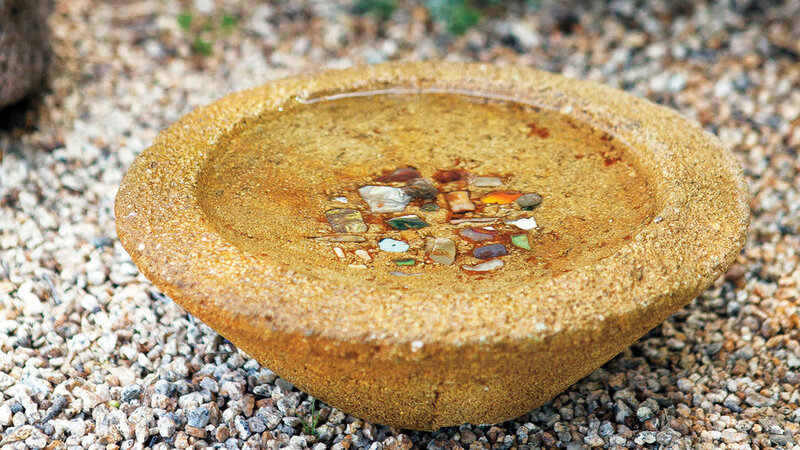 To add a cooling touch to a sunny garden corner, and invite thirsty birds, set an outdoor water bowl among stones or plantings. This one is just 8 inches across. Made of caramel-colored hypertufa, it’s studded with small ceramic nuggets. Hose it out regularly to keep the water clean. These chaises pop straight out of the decking. Each back is hinged at the base. You just lift up the far end and insert the prop to hold it open. If you want to use the deck for another purpose, lower the chaises so they’re flush with the deck. A long wall, installed to block an unattractive view, becomes an asset when painted a cheerful purple, underplanted with a long row of Equisetum hyemale, and paired with a perennial morning glory vine.